Amaretto celebrated Summer with the release of the 2017 Summer Edition - da-dum da-dum da-dum Horses! You can get the 2017 Summer Edition - da-dum da-dum da-dum from August 4th to August 18th 2017 at all Amaretto Ranch locations! Hiding inside the 2017 Summer Edition - da-dum da-dum da-dum was the Overo Prism! 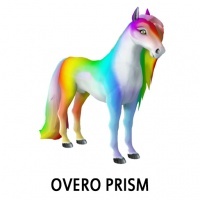 The Overo Prism Style DOES have the ability to pass! This page was last edited on 12 June 2018, at 19:26.